Duplex Pressure Gauges have double pointers and double connections. 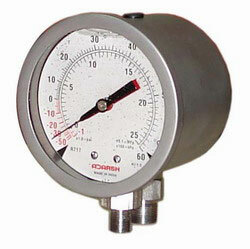 Pressure from two lines can be measured on a single pressure gauge. One black pointer indicates pressure of one line and red pointer indicates pressure of other line. The gauges are glycerin filled for optimum use.